At first glance this agendas ability does not seem to apply easily. Most often used to score from hand the last point after three Astroscripts have been scored, its ability to give tags has not been a large part of the environment. That is the effect Fast Advance has had, in essence turning this agenda into just a finalizing score. That is not all there is to do with it however, and many an enterprising player has used this agenda to great effect by playing upon that Fast Advance effect. 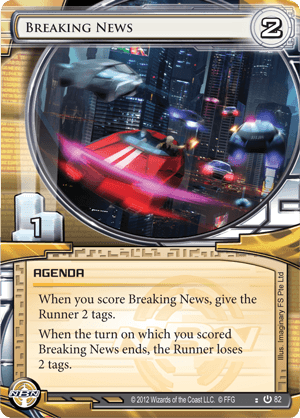 Too often runners do not expect there to be face down agendas in a Fast Advance deck, believing them to be SanSan City Grids being prepared for advancing. Doing so can leave a click to act upon the tags Breaking News gives. Trashing resources such as Kati Jones when loaded up with credits can be very devastating to the runner. Now as well are resources that trash themselves automatically if the runner is ever tagged, making even a score from hand of this agenda a threat to those. As a two for one it will see use for a long time, and while its ability needs to be played around it still can be quite powerful. -It's a 2/1. This alone makes it a good agenda. Being able to score it from hand makes it very valuable. That's one point on your way to 7. Or it is an easy sacrifice to cards like Archer, Corporate Town, or the upcoming Ibrahim Salem. ~Trash critical resources, like a loaded Kati Jones or Personal Workshop. ~Scorched Earth for the win. Only had room for one scorch? No worries, its little brother Traffic Accident can help close. If you are certain of the win, go ahead and use the token on your Astro to set it up. ~A few other cards that aren't usually played but that could be useful are now available. This includes Bad Times, Freelancer, and Big Brother. Now I'd like to mention 3 specific cards that make this agenda even crazier. -The All-Seeing I! Score Breaking News with just one click left and blow away all the runner's resources. Many runners rely heavily on their resources. Pull this off at the right time and the runner might as well throw in the towel. If you have a bad publicity, you may just end up losing that instead. But 1, you will only have the runner hit you with bad pub in maybe 10% of games (and Corporate Scandal won't stop this because it'll be trashed as you score the agenda). And 2, losing a bad publicity for 1 credit is not a bad thing either. -24/7 News Cycle is a card that I don't like because of its interaction with this agenda. It is just too easy to score this and any other agenda. That then leaves you with 2 clicks for a double scorch/traffic accident. It won't be hard to catch even a prepared runner once you have this set up. And if they are somehow still alive, they still have 2 tags to deal with. -The upcoming Exchange of Information is tailor made to work with this card. If you have the one click left and 3 credits... wait, no credits required, you can switch the just scored Breaking News for an agenda in the runners score area, a Global Food Initiative for instance! An astro token would absolutely be worth using if necessary to make this work. EDIT: And I just realized that the two tags you gave them from scoring Breaking News would stick. This is because Breaking News is no longer in your score area when your turn ends! In conclusion then, this is an incredible agenda. A bit too powerful with the current card pool in my humble opinion but one that is here to stay. I'm glad that they put this agenda on the MWL. Combined with the much needed limit on Astro, I think it'll be easier, fairer really to play versus NBN.